I was at a party last night and bumped into someone who showed me how they use their cel phone to download the Some Assembly Required podcast. Apparently some celular phones can be used as mp3 players, and he downloads the podcast to his phone and listens on the go. So that's pretty cool. I've been curious how people listen to the podcast. I just use my computer to listen to music, these days. I don't even have a CD player anymore, let alone an mp3 player. Drop me a line and let me know how you listen to the Some Assembly Required podcast. I'm curious! My contact info is online, at the contact page at the SAR site. Episode 96 is on the way. This was a pretty good episode, featuring a good mix of styles, including a track by Myeck Waters, who is our featured artist this week, here at the blog. I believe it was Jim Allenspach who sent me this CD, several years ago. Its called "Myeck's Big Waste o' Time." If I remember correctly (kicking myself for not saving my email correspondence with the artist), the tracks on this disc were originally composed by Mr. Waters and a couple of siblings, as children, based on the records at their disposal, in concert with a Sony reel to reel tape recorder. He's cleaned up and perhaps even reconstructed the tracks for this CD. The photo is of Myeck Waters, as a child, perhaps with the tape machine they used to create their original compositions? Myeck Waters also contributed to the Dictionaraoke project, a few years back, where sound artists downloaded sound clips from a few different online dictionaries, and... Well, here - they put it best... this is from the Dictionaraoke website: "Audio clips from online dictionaries sing the hits of yesterday and today. The fun of karaoke meets the word power of the dictionary." I've played some dictionaraoke a couple of times on the show. That might make a good focus one of these days. Anyway, the Myeck Waters track in question, played on this week's podcast, is not a dictionaraoke track, but you can download a variety of examples of his sound collage from the official Myeck Water's website. *Are there any additional names used to describe this project: The project is called myeck's big waste o' time, but in the past I also called it Attack of the 50-Foot Robin Hood. *Do you use a pseudonym? Myeck is a nickname, my legal name is Michael Waters. *Tape manipulations, digital deconstructions or turntable creations: "Digital Deconstructions" works for me. 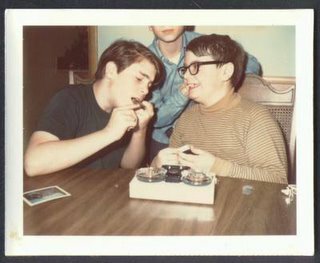 When my brothers and I first started messing around with this in the 1970s, of course, it was tape manipulation, or rather tape recorder manipulation. *Original Location: I grew up in Wisconsin. *What is your creative/artistic background: I have no artistic training, aside from a year or two or guitar lessons from some totally disinterested geezer in the cellar of a music store. I have always been fond of altering existing things to be funny and/or unsettling, starting when I realized I could erase the text in My Weekly Reader in grade school. In the early 1980s, an older brother, his girlfriend and I made two 3-song singles under the name Vibrant Fiasco. No use of pre-recorded materials though, just instruments and voices and a TEAC 4-track. *History: I've been messing with recorded sounds since the early 1970s. *Born: I was born in 1958. *Philosophy: If there is a philosophy, it's that taking things out of their original context makes them interesting in new ways. *How would you like to be remembered: As Angelina Jolie.